The Chatham Anglers (15-13-2) will look to continue their recent post-off day success in a matchup against the Brewster Whitecaps (7-21-3) on Tuesday at Veterans Field. After losing its first two post-off day games of the season, Chatham has come back from its day of rest successfully as of late with consecutive wins in such contests. The A’s — along with the other nine Cape League teams — worked out at Fenway Park during Monday’s off day. The Anglers have won five of their last seven games, including three-straight from July 12 to 14. Despite falling to the first-place Yarmouth-Dennis Red Sox on Sunday, Chatham sits comfortably in second place in the Eastern Division, trailing Y-D by four games and leading the Harwich Mariners by three games. Three of the Whitecaps’ seven wins have come in their last six games. They own the worst record in the Cape League and are the only team yet to surpass 11 wins. Brewster ranks at or near the bottom of the league in several offensive and defensive categories. They have scored the joint-fewest runs (114) and sit second-to-last in home runs (11) and batting average (.224). The Whitecaps’ staff has allowed 25 more runs (171) and walked 21 more batters (140) than any other team in the league. Three CCBL All-Star selections — Dominic Canzone (Ohio State), Joe Donovan (Michigan) and Cameron Eden (Cal Berkeley) — highlight the Whitecaps’ offense. Canzone leads the team with a .311 batting average while Eden ranks tied-for-sixth in the league with 16 RBI. The A’s had their three-game win streak snapped Sunday in a 5-3 loss to the Red Sox. 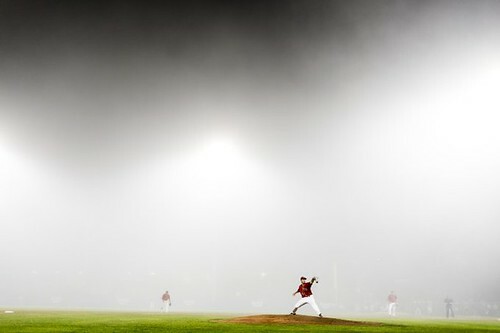 Fog loomed over Veterans Field for most of the game before it thickened and settled at ground level in the eighth inning, forcing the umpires to terminate the game. The famous Chatham fog struck again Sunday, forcing the A's and Red Sox to play a shortened game. Jeff Belge (St. John’s) surrendered two home runs in the first two innings to put Chatham in a 3-0 hole, but Blake Sabol (Southern California) responded. The left-handed hitter slugged a long ball in the second frame, his league-leading seventh home run, for the third consecutive day. The Anglers reduced the deficit to one by the fifth inning but Christian Koss (UC Irvine) hit Y-D’s third homer of the game to give the visitors a 5-3 lead. Both teams failed to score over the next three innings, and the game was officially called two batters into the bottom of the eighth. Because the eighth inning was not completed, the game reverted back to the last completed inning, the seventh. The Whitecaps have dropped two of three games to the A’s this summer. The two sides each saw results go their way in a home-and-home series on June 14 and 15, the third and fourth days of the season. Chatham took the first game, 8-0, at Stony Brook Field, behind three hits from Tristin English (Georgia Tech) and a three-run homer from Spencer Torkelson (Arizona State). The next day, the A’s suffered a 10-1 loss at Veterans Field. Brewster used a five-run second inning and four-run ninth to separate themselves from the home team, who got their sole run of the night from a Greg Jones (UNC Wilmington) solo-shot. On June 20, the most recent game between the Eastern Division foes, Chatham shut out the Whitecaps, 7-0, at Stony Brook Field. Davis Daniel (Auburn) and Hunter Gaddis (Georgia State) tossed a combined eight inning of scoreless ball, allowing two hits. Torkelson belted a two-run round-tripper and John Rave (Illinois State) tallied two RBI in the win.